You have made a particularly good start to the module Mark. You have displayed an encouraging talent for observational studies, showing a good and competent technique and a willingness to try new media. You do however tend to tighten up when producing the final finished pieces. As time goes on and your confidence builds I have no doubt that you will produce some very fine work. ‘Tighten up when producing final finished pieces’ This was so true, most of the techniques I had learnt in this first part of the course were all about fluidity, a relaxed hand, using the pencil in ways that would have probably made these two finished final pieces look very different. However, I did use a lot of these techniques in my final pieces, I just think that they are not visible enough. The first assignment is treated as a diagnostic tool to allow the tutor to see where help may or may not be needed with regards your future drawing endeavours. 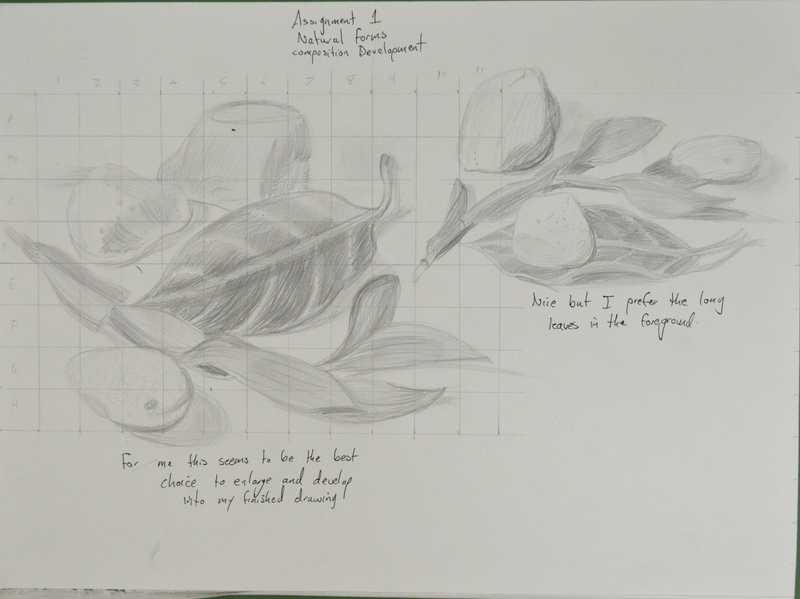 The amount and quality of preliminary work you have included in your sketchbooks clearly outlines that you have a focussed and deliberate way of working. The drawings show a willingness to confront and question the suitability of materials to the subject matter you aim to portray and have been honestly contemplated, and this shows in your final pieces. The two finished studies are thoroughly researched and considered in terms of compositional structure, materials, colour palette and technical application. 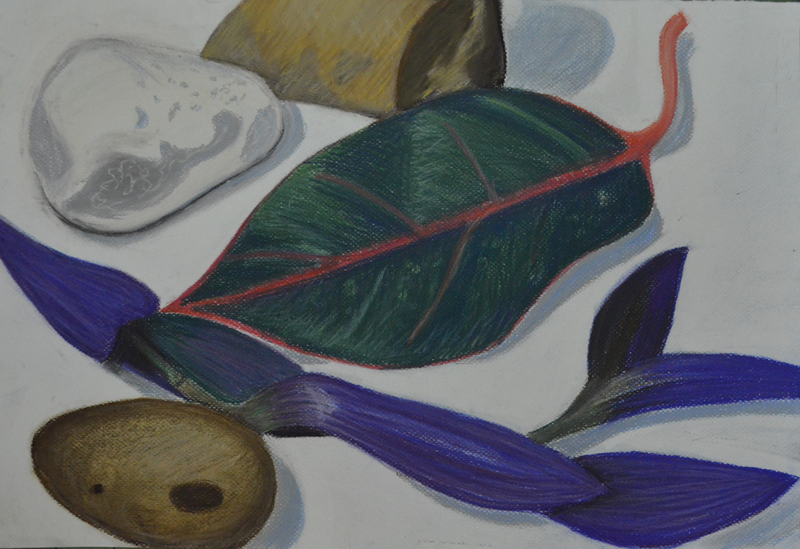 The natural object study has a balanced compositional arrangement and successful harmonic colour palette however I feel it has been cropped a little too tightly. 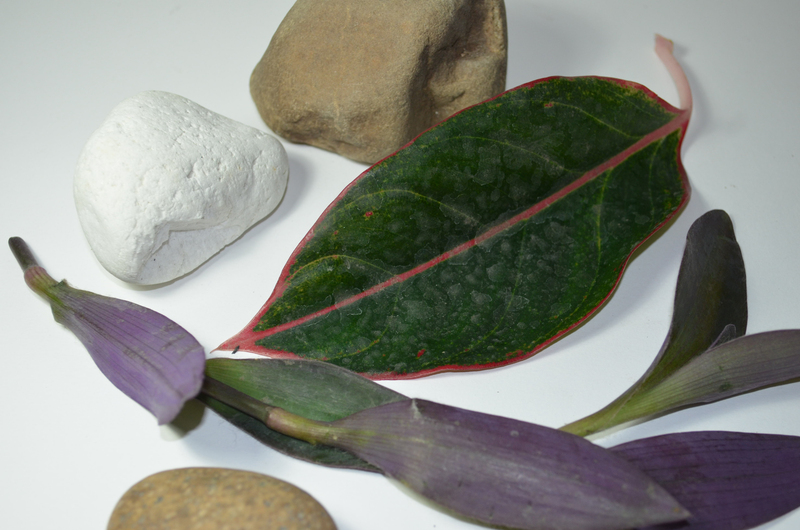 The composition as a whole would benefit from a larger area of negative space, especially at the upper framing, around the pebble or rock in the background. The addition of this negative space would accentuate a sense of perspective or feeling of receding. 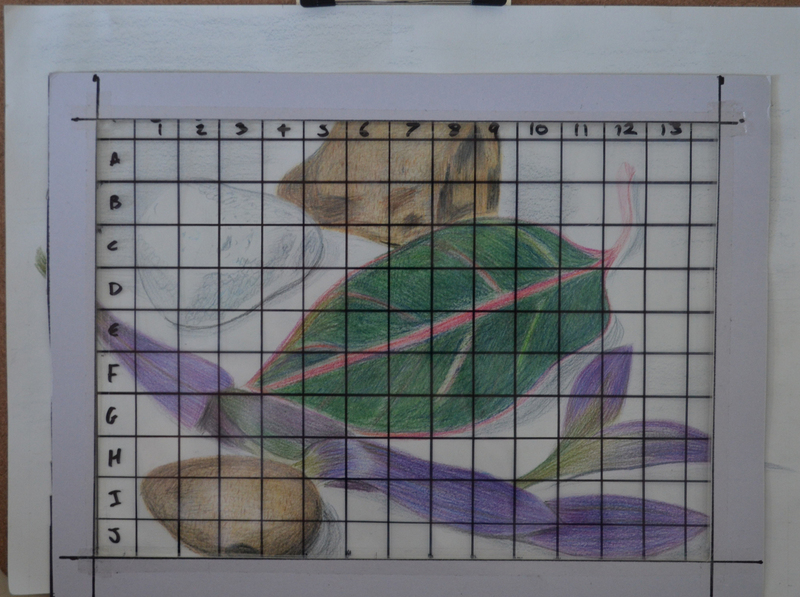 Looking back on your preliminary work in relation to this piece I found that the compositional development sketch in colour pencil worked a little better. It has vivacity and more space to breathe and this I feel is missing from the finished piece. The development sketch possesses a more gestural and immediate rendering whereas the finished piece appears more guarded, as if you were slightly hampered or aware that it needed to be ‘finished’. The pressure we put on ourselves to produce something that is finished and ‘special’ can often hold us back, impeding a more direct and fluid representation. Yes, I totally agree here that the finished piece was a little too cropped, I had been following other students’ blogs and thefeedback they had received from their students, leaving too much background space etc. and I wanted to fill up the paper, however if I had positioned what I drew in the study better I would have accomplished this as well as not omitting important negative space. As with the natural object study the preparatory research you have done for the man-made piece demonstrates a true motivation to understand your subject. You have thought long and hard about its conception and have displayed excellent indicators and developmental information, in the form of preliminary sketches and annotation, to describe the creative process. It was interesting to read your considerations for choosing the subject matter for this piece and also to read the reasoning for discarding your original compositional idea of the traditional Buddhist items. I would have quite liked to have seen a quick sketch of the latter, maybe even a combination of the two cultural elements – in visual terms it would have been a nice juxtaposition. Having said that, I feel your finished piece for the man-made study worked very well. 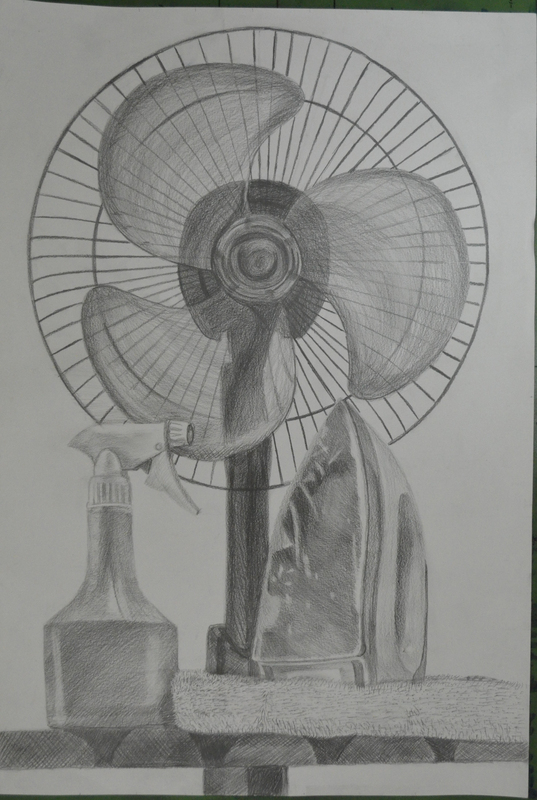 It is evident that you are dexterous with graphite pencil and have delineated the objects with sensitivity, and portrayed their material properties observantly. The composition has a comfortable rhythm to it. I particularly liked the way you reconsidered the placement of the plastic spray bottle to improve the composition thus alleviating the possibility of it ‘kissing’ the cage of the fan. The drawing has good differentiation of tone and representation of volume. 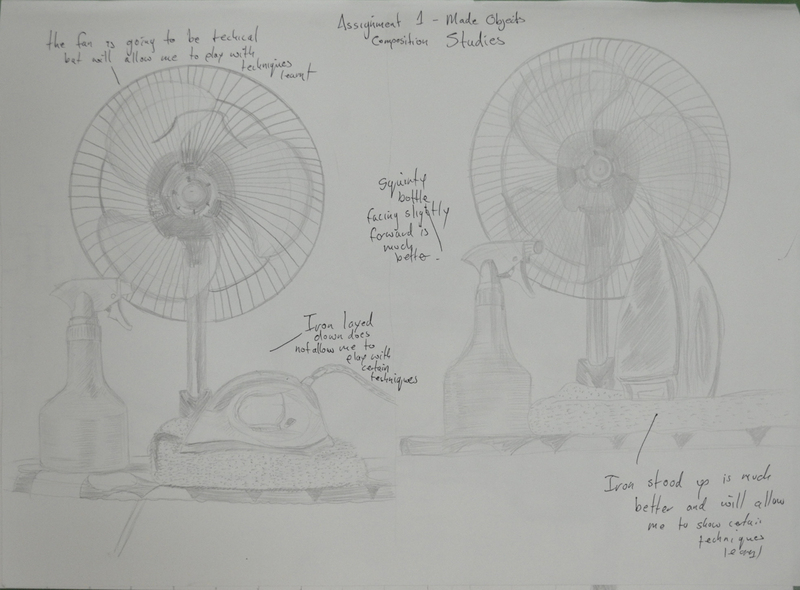 The manner in which you have rendered the transparency of the fan blades is particularly well observed. 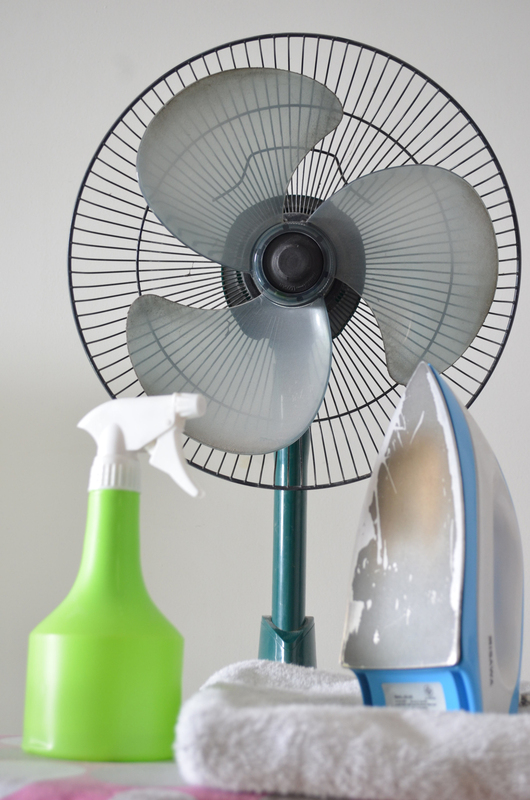 I must admit however having seen the colour photograph of the composition I feel the addition of the limited colour palette would have made for an interesting drawing, with reflected colour on the base of the iron, spray bottle, towel and base and blades of the fan. Try not to be held back by insecurity when using a new medium – you have the skill and adventurous spirit to overcome this Mark. ‘juxtaposition’ and ‘limited colour palette are two new art terms that I learnt from this. The reason for not going with the Buddhist items was that I wanted to work in pencil as a contrast to the hard pastel on the natural objects, I tried colour pencil on the Buddhist objects but the colour wasn’t strong enough. 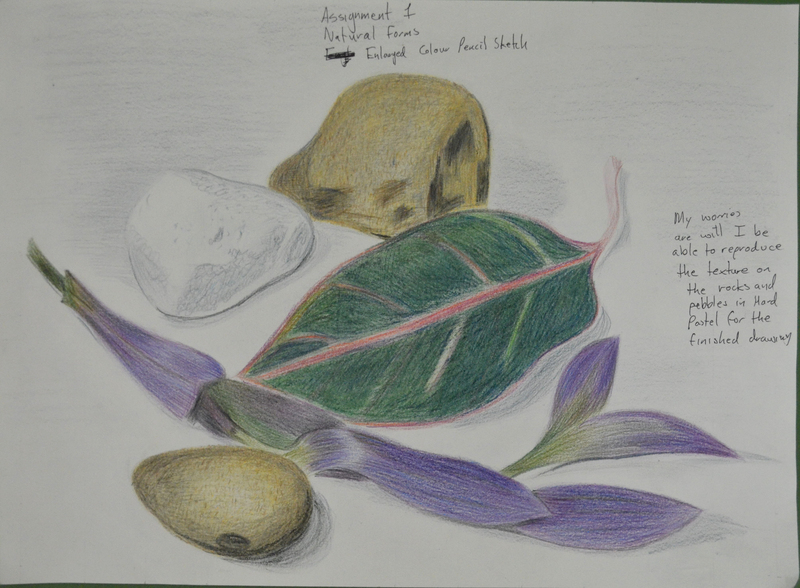 The fact is I should have used pastel on the made objects and colour pencil on the natural objects. I do have some preliminary sketches of the Buddhist items which I will include for assessment. Your investigation into the research points in this first part of the drawing module has been delivered meticulously and with great enthusiasm. You have written your thoughts articulately and with obvious interest in the subjects and have offered reflective opinion on other artists’ work and how it relates to your own. This research and in turn practical discoveries into the artists’ work –artists you were not familiar with – will expand your critical thinking as well as enhance your drawing skills. Your sketchbooks are full of some very promising work Mark. It is plain to see that you are committed not only to the course but to learning and the development of your art practice. You have shown an open-minded dedication to experimentation with different materials and media as well as a determined approach to new methodologies and conceptual constructs. This trait will stand you in good stead for future modules. 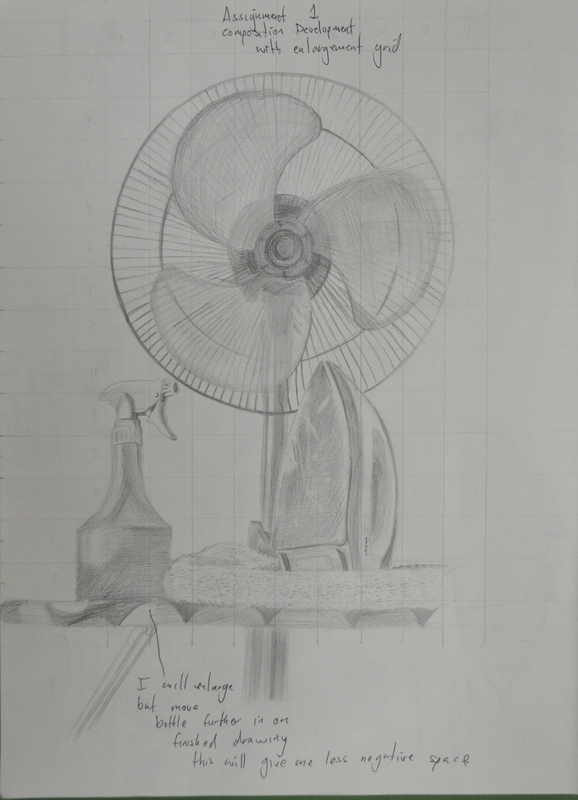 Your drawing is thoughtful and investigative and shows a good ability and understanding of the fundamentals of composition and perspective. These are inspiring words, I personally thought at this stage my keeping sketchbooks weren’t up to scratch, to read positive words words like this is definitely a push in the right direction. The exercises have been considered honestly, with a clear view to getting the most out of the projects. I could see in your mark-making and doodling exercises a direct influence of two of the artists you researched: Max Ernst and Odilon Redon. I also felt encouraged by the inspiration you absorbed of both Patrick Caulfield and Van Gogh. The example of where you work in the style of Caulfield for instance shows good observational skills and an understanding of the artist’s oeuvre by taking that inspiration and producing a piece that represents his style but at the same time maintains your own creative integrity. I have enjoyed researching new artists and have absorbed pieces of them, I know this to be true. I do feel though that the research points are in the wrong place in the coursework and so have to read ahead to the research is helpful in the right modules. The basic shapes and fundamental form exercises (books and boxes, jugs and jars and supermarket shop) have been tackled diligently and with determination. You have a keen sense of observation and focus but can sometimes lose the rhythm when being overly careful with your finished pieces – check the ellipses on the jars and cans in the supermarket shop drawings. 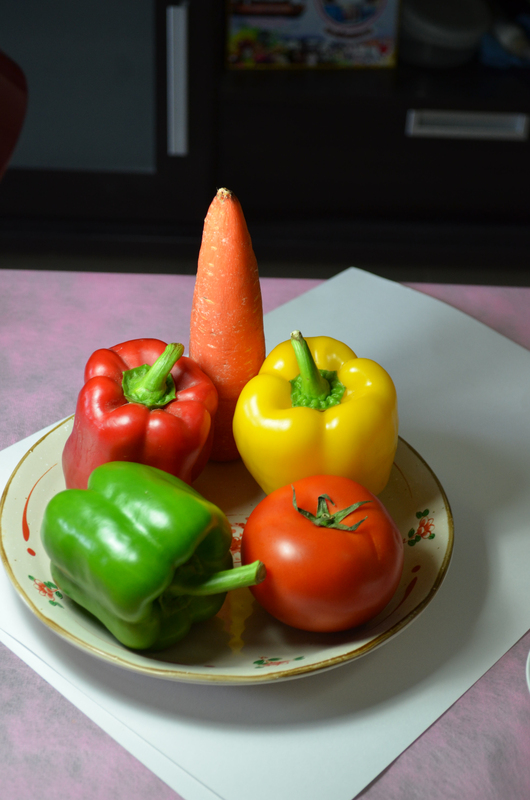 The still life of fruit and veg could do with a little more depth in the cast shadows. 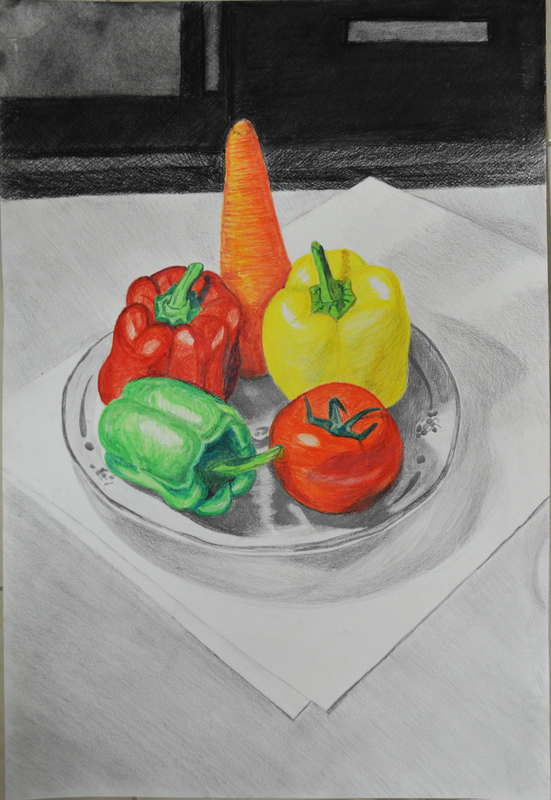 Try to be a little more expressive with colour; see how the reflected colour of the table plays on the green and red peppers and how the yellow of the third pepper is cast on the surface of the plate. You have observed and delineated this especially well in the reflected light exercise. So true, the tightening up as mentioned earlier is probably the cause of this losing rhythm, that and my relief when a drawing goes the way I like and fear that I will mess up if I go further. One thing I do have to say here is that if I hadn’t shown the photo of the composition the colour of the table wouldn’t have been known. Because I made this into a mixed media drawing I felt that I could depict the reflected light while omitting the colour. I do agree with the shadows should have been a lot darker though and shall go over them as I feel this is a piece that could be submitted for assessment. All exercises have been methodically researched and thought through and I have no doubt that if you maintain this determination and enthusiasm you will see a steady and confident progression in your work. Pumpkins, 1994-95. Pencil on cardboard. Fundación ICO, Madrid, Spain. 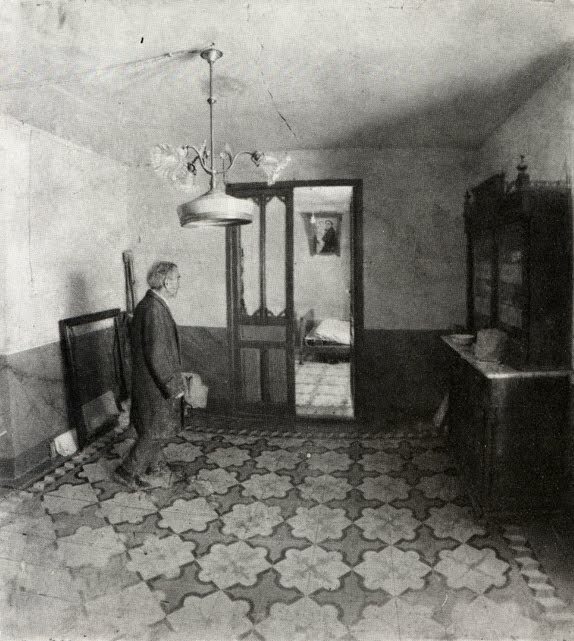 Antonio López Torres’ House, 1972-75. Pencil on paper. Fundación Sorigué, Lérida, Spain. Here is the research point for Antonio López Garcia . Continue to work just as you have been doing Mark but try not to get bogged down or tighten up when faced with the final piece. Maintain a loose and fluid hand. The next assignment gives you the opportunity to further experiment with different media but is also about observation in nature – be prepared to capture movement. I am hoping to work through the B.A. (Hons) painting so I will be submitting my work for assessment. Did you do enough preliminary work before starting on your final pieces? Yes definitely, the preliminary work not only helped me decide on the best composition for the final piece but helped me to decide which mediums I should use. In both parts of this assignment it changed my mind about what mediums I would use and also the layout of the composition for the final piece. 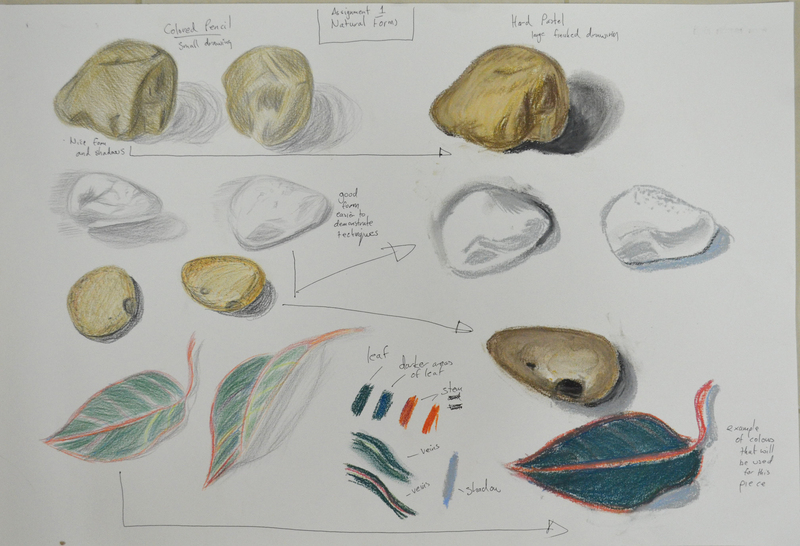 I probably could have done more with regards to colour blending and make more notes on which colours to use for the Natural Objects. 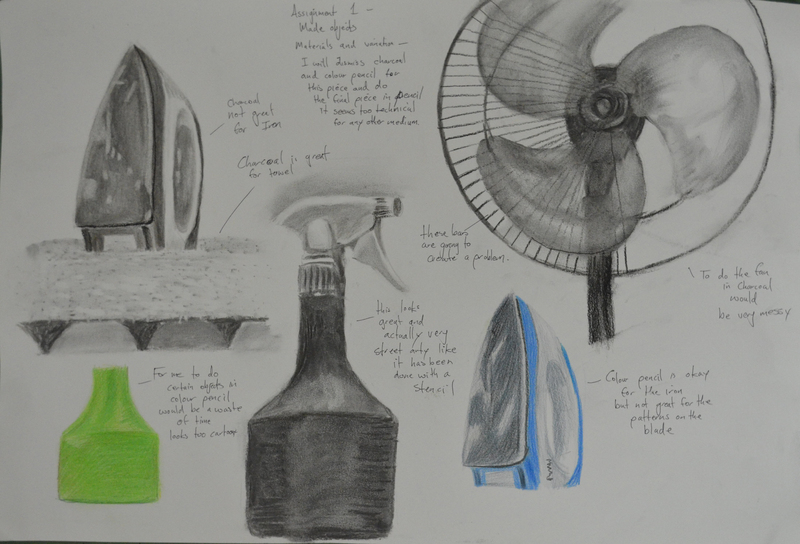 The large drawing for Made Objects I believe was a very accurate interpretation of the still life group even after playing down certain details such as the amount of bars on the electric fan cage. 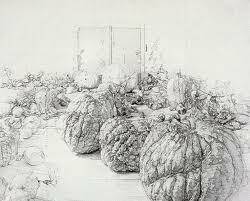 However I I’m not too happy with the interpretation of the still life group in the large drawing for the Natural forms. 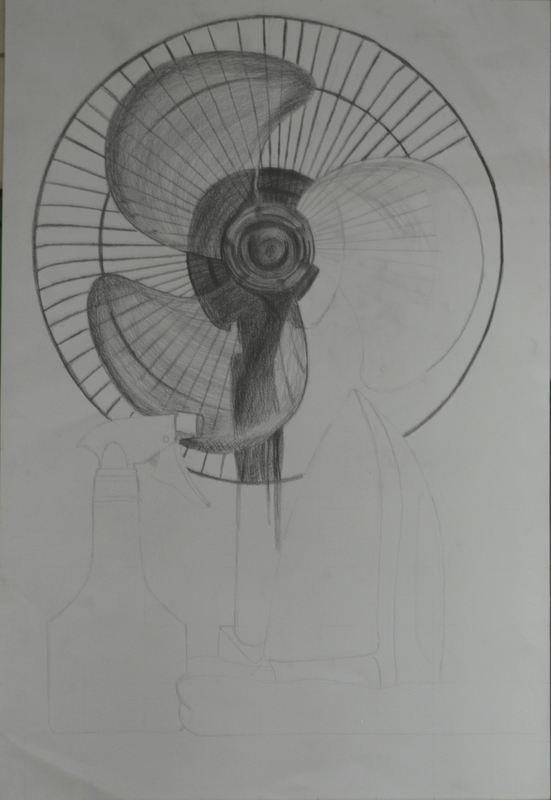 There are certain shapes on the edge of the drawing that I know are not the same as the actual objects this was due to moving the objects about trying to find the composition that I chose to develop, then having to work from the drawings I had already done and photos that I had taken. Did you make a good selection of objects or did you try to include too much? I believe I made a good selection of objects for both parts of this assignment with a minimum amount of objects in mind as I set out on each project. Do your drawings fit well on the paper, or could they be improved by working on a larger sheet of paper? 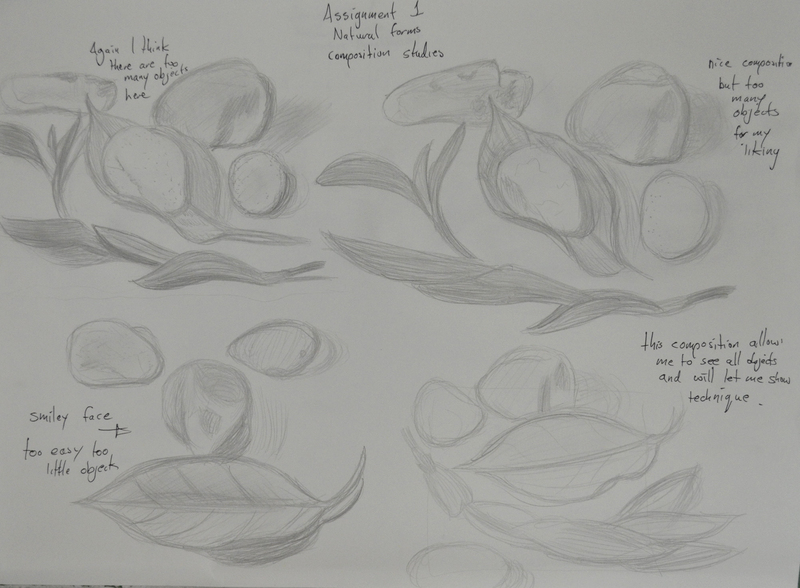 The drawings do fit well on the paper but I do feel that both compositions may have been improved on a larger A1 sheet of paper because of the objects that I chose for the Made Objects and for the medium that I chose for the Natural Forms. Did you have problems with drawing, or find hatching too difficult? I don’t feel that I have any problems with drawing, any problems that do have are probably from the lack of experience with certain mediums. In the Natural forms part of the assignment I thought I did quite well in developing my hatching skills with hard pastel.